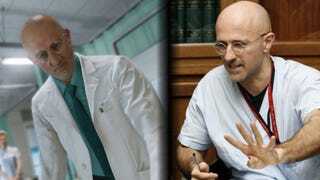 As Kotaku UK reported a few days ago, an Italian doctor called Sergio Canavero is currently at the centre of an insane internet-generated conspiracy involving Metal Gear Solid V, head transplants, and a whole host of other mad ideas. To cut a long story short, because of his strong resemblance to a doctor who appears briefly in a trailer for Metal Gear Solid V: The Phantom Pain, Dr Canavero has found himself the centre of attention in some sectors of the gaming world over the past week. He’s been contacted by several internet strangers trying to link him to Kojima, and has stated that he intends to seek damages from Konami for using his likeness without permission. During my conversation with Dr.Canavero earlier this week I found a lot of the answers that I was looking for about this whole mess, but I wasn’t fully satisfied. Today, I spent some time on the phone with Dr Canavero’s lawyer Stefano Ponte, and things took a slightly different turn. I pointed out to Mr Ponte that while the whole context in which the trailer character is presented definitely lends itself to a lot of debate, the character’s image was scanned from the actor Ian Moore. Not to mention that, aside from those brief snippets in the trailer, we still know absolutely nothing about the character and how much he is really like Dr.Canavero in terms of personality. I also mentioned the whole Lindsay Lohan/Rockstar affair; based on that, I’m not terribly sure that legal action would have legs. But then, I’m no lawyer. I felt it was worth telling Mr Ponte that for the Metal Gear fanbase especially, it’s pretty normal that for every trailer, image or tweet released, there’s a new conspiracy or speculation going on in a matter of seconds. As it happens, I’m a YongYea level of MGS nut, maybe even bigger (big fan by the way, Yong), so I’m hardly unfamiliar with the kind of trolling and teasing that Kojima is so fond of. Often, the links and speculation generated by the fanbase bear little relation to what’s in the product itself. This time, it just got a little out of hand. Here’s a summary of what it says: Canavero claims that on the 19th of April he was contacted via email by an unknown British person (this doesn’t appear to be a media outlet, just a random personal address). The email contained a link to a trailer for an upcoming game in which he recognised himself in a digitalised format, presumably from a video of one of his TED conferences. He seems, based on his testimony on the papers, to be concerned about the fact that the subsequent images in the trailer are very violent, and about how this might be linked to his image. After specifying once again that he didn’t know the person who sent the email, he says that right after that he started receiving dozens of phone calls from one individual (he mentions only one phone number with a 0044 prefix) asking him if he knew about Phantom Pain, while laughing. Then there’s the part about him contacting his lawyer and another part in which he talks about the Twitter account. The doctor specifies that he’s never had any social media account of any kind. Just to put the brakes on any crazy internet rage reaction and to put it in layman’s terms: this kind of document is usually what starts an investigation and protects the person who files it. That’s all. Only after the investigation has been conducted will the results of said investigation determine whether something’s going on or not. To put it simply, this police report is not such a huge deal – not yet at least. It’s a very standard practice. Overall Mr Ponte seems way more cautious than Dr Canavero himself in his approach to the whole situation. I mentioned how excitable Canavero sounded during my conversation with him and how passionate he was – I also told Ponte that he asked me about the cost of the game and how many copies it would sell. It sounded like Mr Ponte has his work cut out trying to prevent his clients from losing their heads (so to speak). If you think about it, any big innovator was labelled as a crazy person at least once in their life. In the last four days reporting this story, I’ve called various hospitals, asked for help from some friends at the biggest news agencies in Europe to cross reference documents and statements, and juggled legal issues. But there are some things that make it difficult to pass accurate judgement on what’s going on here. On one hand, Occam’s razor tells me that the simpler explanation (and all the evidence I’ve gathered) points towards Dr Canavero being both genuinely concerned about his image being linked to what he considers a very violent video game and, at the same time, happy about the publicity that all of this is bringing to his cause. His lawyer, meanwhile, is very professional and cautious. It’s possible that Kojima really was fascinated by the Doctor’s persona (remember that Canavero has been around for a long, long time and Kojima does a lot of research), and drew inspiration from some of his traits or his work before hiring an actor that reminded him of Canavero. It could really be as simple as that, art imitating life in the oldest of ways. I’ll be honest with you: what really got me interested in this whole ordeal, and what ended up sending the whole fanbase crazy, is that if you take the two subjects of this story (Kojima and Dr.Canavero) and really look at them… don’t they seem like a match made in heaven? If you ask me, instead of pursuing legal proceedings, Cavanero should be trying to find a way to actually work together with Kojima instead. Imagine how crazy the fanbase would go. Gabriel Galliani is an Italian journalist who writes for Official PlayStation Magazine, Byte Size Impressions, and more. Find him on Twitter.